It hasn’t even been a year since Instagram introduced Highlights, and brands are already making the most of it. Some are using them to provide useful information, while others are using them to share customer-generated content. There are plenty of opportunities to benefit from your Instagram Highlights if you know how to do it right. Califia Farms is a brand that sells organic, non-GMO beverages such as almond milk and creamers. They use their Highlights not only to promote their products but to share practical recipes that their customers can make with their products. This is a great way to establish the scope of your product and inspire people to use it. 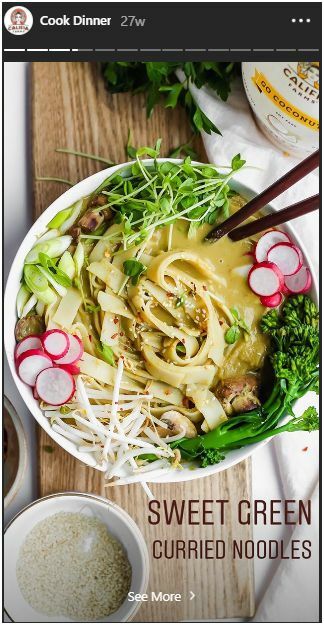 The Highlights contain appealing images of the recipe being shared, which makes it extremely enticing for anyone who’s viewing it. They also include a link to the full recipe in the “See More” button. This makes it easier for followers to access the information they need while driving traffic to the Califa Farms website. 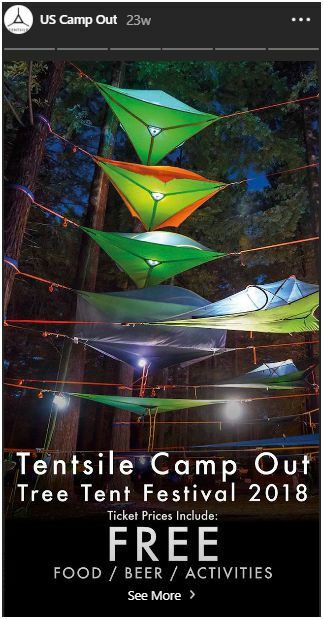 Tentsile is a brand that sells tree tents, which have the versatility of hammocks but are still comfortable and secure like tents. 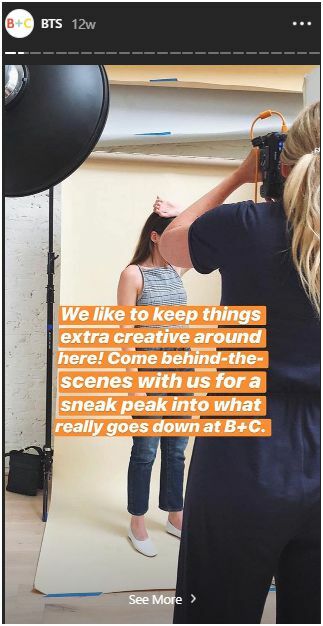 The brand uses their Instagram Highlights to share content about the tree tent festival they’ve organised. They initially added a Highlight promoting the event with useful information such as what’s included in the ticket price. This also included a “See More” button directing people to a page where they can find out more information about the event and buy their own ticket. After that, they added videos and images from the event to entice and engage their followers. Sharing content from your event can trigger a fear of missing out and can drive better participation in your next event. Letterfolk sells premium letter boards and stationery, and they have a strong presence on Instagram. They regularly add Highlights, which they’ve neatly categorised for easier navigation. They create different categories for some of the products in their store such as the Today Planner, the Composition Book, and the Passport Collection. Each category not only promotes and gives a closer look at the respective product but also provides practical tips on how to use it. They also have Highlight categories for their Backstory and Q&A sessions. When you neatly categorise your Highlights, it’s easier for your followers to find what they need. They won’t have to look through scores of images and videos just to get the information they need. Postmates are couriers that provide delivery service for food, groceries, etc. They showcase customer experiences and memes through their Instagram Highlights to entertain their audience while showing the good work they’ve done. But the best part is that they also have a Highlight category where they share the stories and experiences of celebrities who use their service. When a celebrity or authority figure vouches for your product or service, it gives you more authority and can help you win people’s trust. 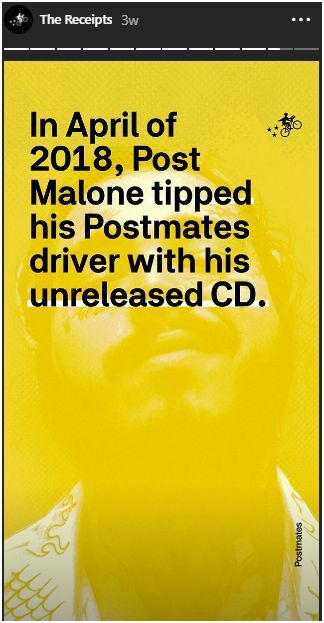 Postmates added Highlights telling the stories of NBA star, Kyle Kuzma, and rapper, Post Malone, who regularly use their service. They talked about Kuzma’s favourite restaurants and dishes. They also talked about how much Post Malone spends on biscuits and how he tipped his Postmates driver with his unreleased CD. In many of these Highlights, they add a ton of humour that reflect their brand’s personality. Brit + Co is a media company that focuses on entertaining and educating women. They also sell products like decor and phone accessories that their audience may like. They use their Instagram Highlights to provide handy DIY tips and inspiration. But in addition to that, they also showcase what’s going on behind the scenes of their photoshoots. Giving your audience a behind-the-scenes look is a great way to humanise your brand. It gives your followers a chance to see all of the work that goes into creating your products and content. It also gives them a better look at the people behind your brand. This can help them build a stronger connection with your brand and thus, help you grow your community. Every now and then, there’s a new Story challenge that takes over all of Instagram. Almost everyone participates in it and gets their followers to engage and participate too. Sometimes, brands and influencers come up with their own challenges to engage their followers. Or they participate in a trending challenge to create fresh and engaging content that their followers might like. Kate Spade New York decided to start their own challenge to entertain their followers. Since the brand is celebrating their 25th anniversary this year, they came up with the 25 challenge and added it as a Highlight category. For the 25 challenge, they create content in which they attempt to fit 25 products inside one of their bags. This helps establish the product’s value in a creative and entertaining manner without being pushy or overly promotional. Osprey Packs is a brand that sells high-quality adventure backpacks. Their Instagram feed is breathtaking, with pictures of people at different travel destinations carrying their backpacks. As for their Highlights, the brand wanted to give some recognition to the artists they work with by doing interviews with them. Showcasing the interviews helps humanise the brand significantly. It also helps the artist by giving them the recognition and appreciation they deserve. This can help make them feel like part of the brand, which could further strengthen their relationships. For their Artist Series Highlights, the brand interviews artists who’ve designed some of their products. 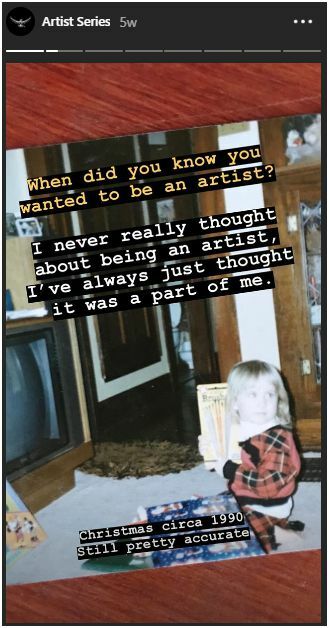 They ask them questions like which artists inspire them and when they wanted to become artists. Desenio is known for their high-quality posters and art prints. They have a massive following of over 770,000 on Instagram. They use their Highlights to share trends and inspiration, as well as their brand’s news. The best part is that they have Highlights to promote sales and discounts for their customers. This is a great way to engage the Instagram audience and encourage them to take action. 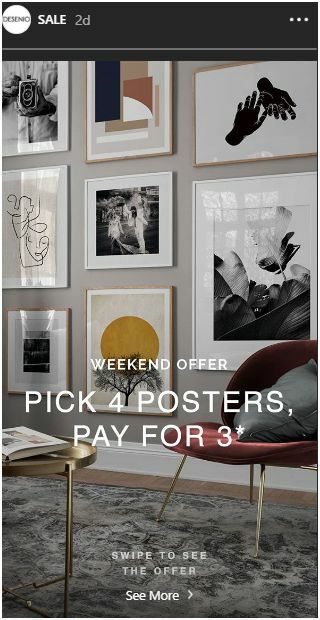 For this promotion, they added text to a highly appealing photo that showcased their posters. This text gave people a clear idea of how long the offer is going to last and what exactly it entails. They also added a clear CTA so that people knew what to do next if they wanted to see the offer. The promotion is simple and precise, and they’ve made the offer easy to access for anyone viewing the Highlight. Lorna Jane is an Australian activewear brand. They have a strong community of customers, as is clear from their 821,000 Instagram following. They fill their Instagram feed with images that highlight their products and quotes to inspire their followers. In their Story Highlights, they share healthy recipes and exercise tips to help their target audience achieve their fitness goals. Additionally, they give their community some recognition by adding a Highlight category for them called #SPOTTED. There, they showcase pictures of influencers and regular customers wearing their products. This is a great way for the brand to show their appreciation for the community, which could help them win their loyalty. Plus, these images act as social proof which can inspire prospective customers to buy their products. They give the brand more authenticity and shows that they care about their customers. 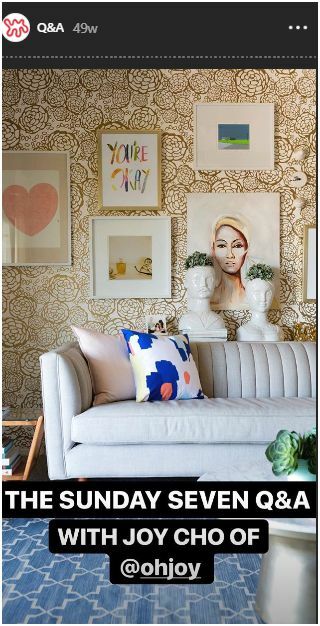 Apartment Therapy is one of the most popular names in home decor and lifestyle, with more than 1.7 million followers on Instagram. It’s extremely satisfying to go through their feed, which showcases some of the most beautiful homes in different cities. Through their Highlights, they give their followers a before-and-after look at various home renovations and take them on virtual tours. One of the best ways they’ve used Highlights is to host Q&A sessions with influential names in the design industry. For instance, they invited the lifestyle influencer, Joy Cho, known for her bright and fun decorating style, for one of these sessions. 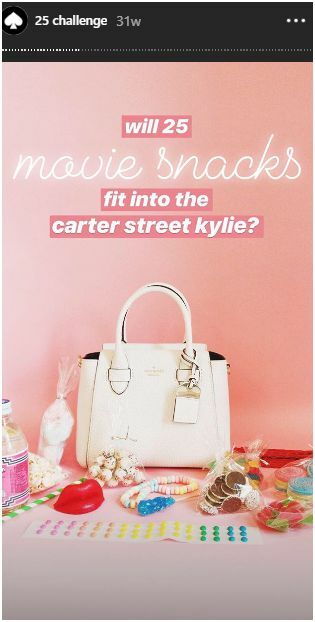 The influencer answered seven questions through videos, which the page added to their Highlights. 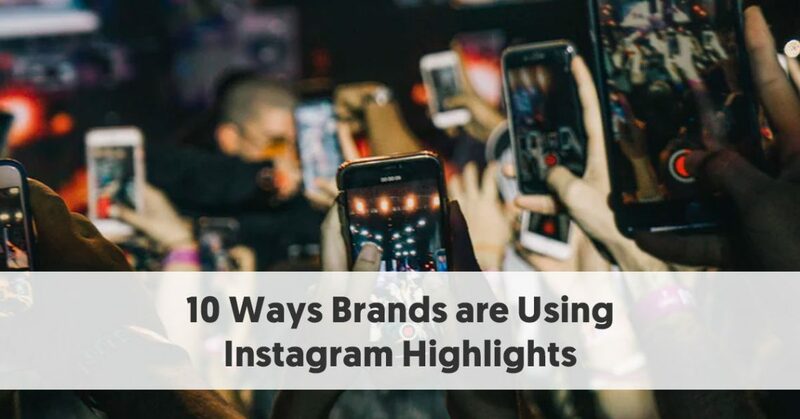 These are 10 brands that have made excellent use of their Instagram Highlights. They promote their products, share exciting news and updates, give recognition to those who deserve it and provide valuable information to their followers. If you need some help with your Instagram strategy, take inspiration from these brands to create engaging and useful Highlights.